Popular marketing campaigns that try to curb college binge drinking by easing peer pressure among students are a failure, according to a new study. A report released Wednesday by the Harvard School of Public Health College Alcohol Study found that alcohol abuse — by a few measures — increased at some campuses that employ what's called "social norms" campaigns to reduce binge drinking. A proponent of the marketing efforts immediately took issue with the findings. In social norms marketing, posters and fliers are put up around campuses with messages and statistics that show students who drink to excess are the exception, not the rule. The idea is to help students who drink to fit in feel less peer pressure to do so. A poster with the slogan: "Most students at (name of the college) have five or fewer drinks when they party," is an example of the marketing style, the report said. Many colleges have adopted the campaigns since the mid-1990s, subsidized by alcohol manufacturers and various government agencies which have spent $8 million on the campaigns nationwide, the study said. Social norms marketing "looks great and it's not expensive to do," said Henry Wechsler, the director of the Harvard study. "The only problem is that it doesn't seem to work. It's a feel good program." The report surveyed drinking patterns on 98 campuses, 37 of which have used social norms programs for one year. 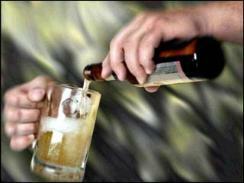 It measured for alcohol abuse in seven different ways, such as having 20 or more drinks in the past month and drinking 10 or more times in the past month. But no improvement in habits was found on social norms campuses by any of the measures, the study said. Wechsler said the marketing fails because students on campuses are influenced more by small group pressure than large marketing campaigns. "On a large campus with 30,000 students who do you relate to?" Wechsler asked. "It's the people in your dorm or your fraternity or your friends. You don't care what the other 30,000 people are doing." The alternative to social norms marketing, he said, is for states and municipalities to crack down on low-priced alcohol specials offered by off-campus bars and liquor stores. The man credited with starting the social norms movement in the 1980s took exception to Wechsler's findings. "The case studies we've seen are finding a 20 percent reduction in the high-risk college drinking rate" over two year periods, said H. Wesley Perkins, a sociology professor at Hobart and William Smith Colleges in Geneva, N.Y.
Perkins called the report the latest in a series of efforts by Wechsler to discredit social norms marketing. Wechsler defended the scientific validity of the study, citing its acceptance for publication in the July issue of the Journal of Studies on Alcohol. John Kaestner, the vice president for consumer affairs for Anheuser-Busch, said the social norms movement — backed financially by the brewery — is an effective tool in preventing alcohol abuse. "Common sense says this program has a tremendous amount of merit," said Kaestner. "And we ought to give it a chance to work rather than take a shot at it."